This in vitro study characterized the removal efficacy of formaldehyde by the Novaerus NV1050 system. Novaerus’s NV1050 system is designed to eliminate harmful gases in order to purify rooms and create safe environments for occupants. The study included three (3) trials and a control run against formaldehyde. Formaldehyde gas was released into a sealed chamber while the monitoring of concentration was logged with specialized detectors. For the control trials, the NV1050 remained outside the chamber, and the gases were allowed to dissipate naturally over time. The NV1050 was moved inside the chamber for the test trials, the chamber was refilled with test gases and the NV1050 turned on once desirable concentrations of the gases had been reached. Chamber control trial data was subtracted from Novaerus trial data to yield net log reduction in the chamber for each challenge. The NV1050 proved to be exceedingly effective at removing formaldehyde from its environment. The four tests had an average net LOG reduction of 2.52 LOG and formaldehyde levels reached 0.00 ppm in an average of 1.1 minutes. In this instance, the main cause preventing a greater net LOG value was the lower starting concentration. 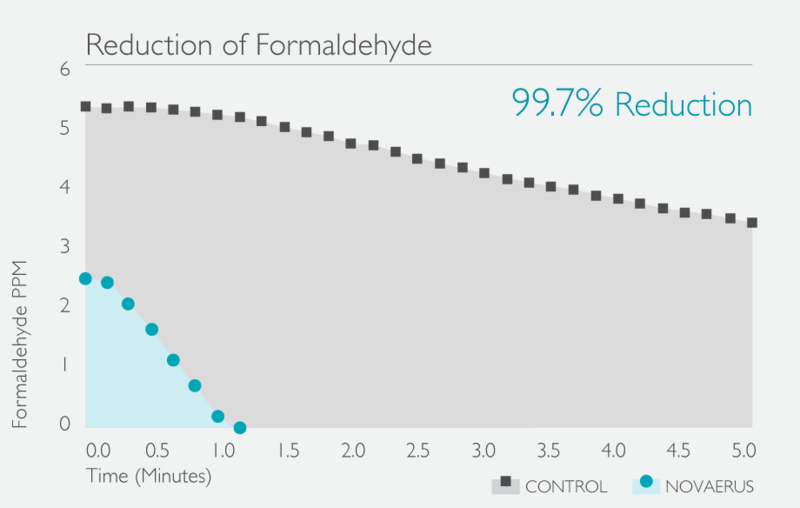 For formaldehyde, the NV1050 system has an equivalent air exchange rate of 641.21 eqACH, a CADR of 6038.10 cfm, and an EPA rating of 16.10 cfm/watt.